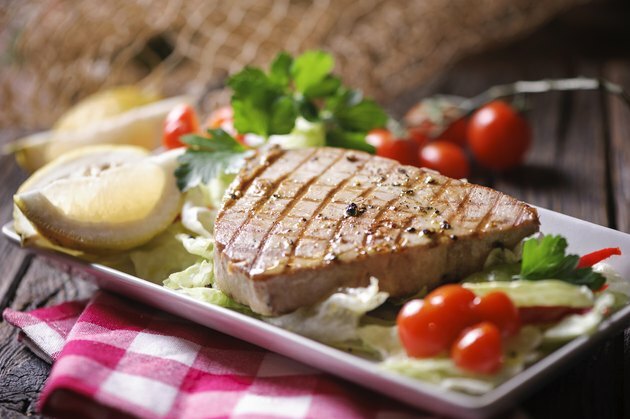 Grilled tuna steaks are rich in protein, low in calories and full of B vitamins and minerals. Even though tuna itself won't give you a lot of calories, adding oil during the cooking process can quickly up the calorie content. To keep your tuna steak as light as possible, you might want to use nonstick cooking spray, which only has a trace amount of calories, instead of a high-calorie oil. The exact number of calories in your perfectly grilled tuna steak depends on the type of tuna. Both yellowfin and skipjack tuna provide around 110 calories from a 3-ounce grilled steak. By opting for bluefin tuna steak, though, you'll get over 155 calories from the same amount. If you cook tuna steaks in oil to prevent sticking on the grill, you'll want to account for those calories. One teaspoon of oil adds nearly 40 calories to your otherwise low-calorie entree.